Jill DeWit: And I’m Jill DeWit, and we are broadcasting from sunny Southern California. Steven Butala: Today, Jill and I talk about bad acquisitions. Why would you choose a topic like bad acquisitions? Here’s why. Because yesterday we talked about good acquisitions. It’s the Yin Yang of life, right? Jill DeWit: Bad acquisitions. Bad, bad, bad acquisitions. Steven Butala: Like when the kids are little. Jill DeWit: And how to avoid bad acquisitions, what they are, how to see them coming, how to kick them to the curb. You like that? That’s gonna be my rant today. Steven Butala: Guess what? Bad acquisitions happen, because you pull a trigger on something you shouldn’t be buying. Steven Butala: We have long since done that, I’m so happy to report. I’m trying to think of a bad acquisition we’ve done. Jill DeWit: You know what’s funny? Some of our people think that, oh, because I didn’t exactly double my money, that that’s a bad acquisition. I’m here to tell you that’s is not a bad acquisition, so we’ll talk more about that. Steven Butala: I only made 80,000, instead of 100,000. Jill DeWit: Shucks. I know. Darn. Steven Butala: Before we get into it though, let’s take a question posted by one of our members on the LandInvestors.com online community. It’s free. Steven Butala: Go, Jill. Go. Jill DeWit: I was gonna say for being completely, completely brand new, boy, are you on the right path? You’re gonna kill it. If this is you knowing nothing, holy cow. What are you gonna be like? You’re gonna be a machine a year from now. Steven Butala: Well, this is this person being new at ready to do it, but he’s been listening to the show. Steven Butala: Or talking to people on Land Investors. Jill DeWit: Soaking it all in. Steven Butala: Yeah. Soaking it all in. Steven Butala: Be prepared for that. All kidding aside, you’re brand new, and that’s great. I agree with Jill. You’re gonna do well, but we’ve got all this stuff worked out. It’s way cheaper. If you would just joined the group … This is not a commercial. I don’t care if you join or not. Ask this same thing that I’m bringing up here on Land Investors, if it’s worth it, because you get all the data and all that stuff for $250 a month or whatever the price is now. So, you can save yourself a ton of money by getting educated right up front from all the education that we provide, and you’re gonna save yourself tons of money and time with the data, with our data package. Jill DeWit: Right. So, to reiterate Steven’s point, you got the gist of it. Everything that you spelled out is great. Now, you’re ready for all the missing pieces. There’s a lot of little, moving parts in there. I’m glad that you’re figuring out the acquisitions. You got to figure out the purchasing the property part, and there’s a lot to it too. Steven Butala: You’ll get offers back. Jill DeWit: That’s good though. Steven Butala: You’ll get signed offers back. Jill DeWit: But, yeah. I guess the point is too, I love where you’re going, as far as the big picture concept. There are still some more things that you want to look at, like census. Steven Butala: … price per acre. Those two things don’t mix. Steven Butala: The lowest priced property. Steven Butala: You have to later on. Jill DeWit: But starting out that way, that’s awesome. I don’t have a lot to say, other than you are totally on the right path, and I know we can help you take it from there, like you said. Steven Butala: Absolutely. There’s a lot of details. Jill DeWit: Great question. Was that a ringer? Steven Butala: Maybe. It was too much what we say. What do you mean by ringer? Jill DeWit: I don’t know. Is somebody testing us? Steven Butala: Yeah. That’s what I mean. I think that might be kind of it too. Jill DeWit: Yeah. Not a ringer, but is somebody … That was good. Jill DeWit: Who wrote that question again? Jill DeWit: Oh. Just kidding. Jill DeWit: That’s gonna be a good one. I’m gonna question that question when I see it, but no. These are real. Go look at our online community [inaudible 00:06:14], and I’m like, “Who are you, Max?” It’s kind of funny. Steven Butala: Today’s topic. Jill almost always knows the new people too. Today’s topic, bad acquisitions. This is the meat of the show. What the hell do you mean, bad acquisitions? Why would you talk about bad acquisitions? Steven Butala: Because you want to do good acquisitions. Jill DeWit: You know, I just thought of a Max right now, by the way, who is very smart. Now that I think about it, I think I know who it is. Sorry, Max. You are real. If you’re the Max I’m thinking of, that there’s a couple of you together, I know. Okay. Steven Butala: What’s a bad acquisition? So, if you listened to the show yesterday, a bad acquisition is not one you lose money on or it was hard. Here’s a bad acquisition, where you didn’t follow your acquisition criteria, where you strayed. You got interested in something shiny over here that you know you can make money on, and it took away your attention, and it veered you from the path of becoming the actual big picture land/real estate investor that you wanna be. I’ll never forget it. Jill and I did a live event right when we decided to do Land Academy. Almost immediately we were invited to this thing to talk. Back then, it was a version of a meet up. Jill DeWit: Big REI group thing, like 100 and something people in there. Jill DeWit: They asked us to speak. Steven Butala: It went off well. There was a kid in there, he was really intrigued with the whole thing, and he’s doing a deal. Jill DeWit: I remember him. Steven Butala: Yeah. He was doing a deal, and it was a messy deal, so it was a piece of rural property they had. It was all sectioned and parceled off. Imagine like a farm that’s been owned in a family for 100 years, and there’s a house, and an old house, and a new house. There’s a couple barns on the property and tons of … It was just kind of a mixed use deal. I run away from mixed use deals, by the way, because they’re just … you gotta do stuff. So, this guy, I said the same thing I’m saying right now, “Run away from this deal.” Yes. Jill DeWit: I remember that. Steven Butala: It’s absolutely possible to make half a million to a million bucks, and you’re gonna spend years. So, he didn’t. I remember hearing from him a year later. This is like 2015. Jill DeWit: I remember this. Yeah. Steven Butala: He’s shaking his head and crying about the whole thing. He was a mess. He was asking me where to help him to get out of it. I said, “If I had a nickel for every time somebody emails us and says, ‘Can you really help me with this?’, or, ‘Can you develop a website that’s gonna help us do this a lot faster?’ If we did that, we would never do this.” So, I have to, in the same thing that I’m talking about, follow not my acquisition criteria, because we’re past that. We do that well, but Jill and I have to constantly keep ourselves on the tracks to where we want Land Academy, and House Academy, and all this to go, because I’ve 20 great ideas that are nothing more than a massive distraction. Jill DeWit: I don’t think people realize how many deals that we do turn down. We don’t buy them all. As of right now, as a matter of fact, we turn down more than we buy, way more than we buy. Steven Butala: Oh my gosh. You’re right. Jill DeWit: It’s probably more than 10 to 1. Steven Butala: That’s a great point, love. Steven Butala: Yeah. 10 to 1. Jill DeWit: You especially, because when you do those consulting sessions with people, I hear you all the time that you’re saying, “I would not do this deal.” You know? You have no problem, good, bad, or otherwise, Steven. You are very upfront and honest. Sometimes that’s great, and sometimes I don’t want to know that that doesn’t look good, because I feel good in it. Steven Butala: Yeah. Do I look fat in these jeans? Steven Butala: We all know how to answer that. Jill DeWit: Yeah. That’s not your best look, sweetheart. Steven Butala: I’m not sure those jeans are part of your acquisition criteria. Jill DeWit: Where did you get those? Yeah. How long have you had those? Steven Butala: That’s what she says to me. Jill DeWit: Yeah. I know. Actually, that’s it. Steven Butala: How about we wear some underwear from this century? Jill DeWit: My favorite is, hey, where did my favorite shirt go? Gee. I don’t know. Steven Butala: Which one? You mean the ones with the holes all up and down the back? Jill DeWit: Gosh. I don’t know, sweetheart. Bad acquisitions don’t do it. You know what? I’m gonna get a little inspirational here. If something is not sitting right, and if everything looks good on paper, but you just feel like you’re missing something … I’m not sure about this cellar. I’m not sure about this property. I have a few questions. I tell you, if it’s a gut feeling, I wouldn’t do the deal. There’s too many others. Steven Butala: That only works for women. Jill DeWit: Oh. Well, then ask a woman. Steven Butala: Men are hardwired to be distracted. Steven Butala: I’ll go out on a limb here. Here’s my girl. Steven Butala: I love her, and we have history. Oh, wait. There’s a girl over there? Jill DeWit: Do you really want to use this example? Steven Butala: Wait a second. Wait a second. Look. I’m not saying I’ve ever partaken in anything like that. Steven Butala: I’m just saying. Jill DeWit: You don’t have a better example. How about a boat? Steven Butala: Yeah. A boat. There it is. Jill DeWit: Here’s my beautiful boat. Steven Butala: Boats are good. Steven Butala: There’s a bigger boat. Jill DeWit: … 10 years younger. It looks an awful lot like my boat. Steven Butala: That’s a bigger, better, but younger version of the boat that I already have. Jill DeWit: But it’s 10 years younger. Actually, it’s the same boat 10 years younger. Steven Butala: So what that it’s more expensive. Jill DeWit: Yes. You know what? I’m not sure it’s gonna treat me as well. Steven Butala: This doesn’t make any sense to me, but I’m gonna do it anyway. Jill DeWit: Exactly. I’m gonna buy it anyway. I’m gonna buy them both. I’m gonna keep my other boat, and I’m gonna buy this boat, because that’s a good idea. Steven Butala: And I can’t afford this. Steven Butala: It’s probably gonna all end in tragedy, but I want both of these boats. Jill DeWit: You know what? I don’t want this boat to be jealous, so I’m gonna get a slip in another marina for that boat. Steven Butala: I don’t know if we should be videoing this. Steven Butala: No. I’m saying we shouldn’t. Oh my god, Jill. That’s hilarious. Jill DeWit: Making my nose run [inaudible 00:13:03]. Steven Butala: … rational feelings about not doing an acquisition. They get really distracted. Steven Butala: Cut your losses. Jill DeWit: Yeah. It’s okay. Get out. Steven Butala: Just get out of there. Jill DeWit: It is okay. You know? That’s happened to us, and we’ve done that, have had transactions in the middle of Escrow, and something comes up. Jill DeWit: And it all falls apart. Steven Butala: … like a week ago, on a deal that we would have made a bunch of money on. Jill DeWit: Right. That’s okay. Stuff happens. Get out of it. Why would you follow through with a bad acquisition, by the way? Steven Butala: Why would you? Jill DeWit: Pride. Are you willing to lose money over it? No. Steven Butala: The tenant? Oh. That seller. Steven Butala: Yeah. I know what you’re talking about. Jill DeWit: That would make it a bad acquisition. That’s a good point. It’s not just about the property. Sometimes it’s about the seller, the terms, whatever it is. Steven Butala: We would have to help her literally physically move, hire somebody to do it. We would have to put her into some place where … She doesn’t know where she’s gonna move. It’s too much work. Jill DeWit: Yeah. That’s a bad acquisition, or potentially. Steven Butala: You really do need to listen to yesterday’s show, because these go together, good acquisitions and bad acquisitions. A good acquisition is one where you don’t have to do any work. For us that’s our acquisition criteria. It’s rubber stamp the thing all the way through when I’m buying the sale, and collect the equity, and move onto the next one. In fact, I’m usually way moved onto the next one after we buy the last one. Jill DeWit: Yeah. You move on pretty fast. Jill DeWit: Yeah. It’s not you. Steven Butala: … or it’s an unexpected lien that I didn’t find. You know, it’s some kind of a mechanic’s lien or a tax lien on it. For us it’s never those things. It’s always to make more money on this deal I need to establish legal access or some version of that, or I didn’t realize the seller wasn’t gonna move out for 60 days. It’s stuff like that. It’s not hidden things in there that we didn’t know about. Jill DeWit: My last point, a bad acquisition is one that keeps you from five or ten other good ones. Jill DeWit: Think about that. Steven Butala: That’s exactly right. We’re data people, right? Steven Butala: We want to send out mail, have it come back, bang, bang, bang, next one, bang, bang, bang, next one. A bad acquisition is what stops you from doing that. It slows the train down. Steven Butala: Boats. My gosh. Well, you’ve done it again. You’ve spent another 15 or 20 minutes listening to the Land Academy Show. Join us next time for another interesting episode, where we discuss larger than you ever imagined acquisitions. 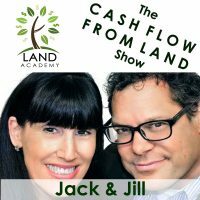 Jill DeWit: And we answer your questions posted on our free, online community found at LandInvestors.com. Steven Butala: You are not alone in your real estate ambition. You’re a crack up, man. Steven Butala: That it was perfect. Jill DeWit: … that you could relate to. Steven Butala: It was perfect. What’s the women version of that? Steven Butala: I mean, women get distracted by men, but it doesn’t seem to be as tragic, for some reason. Jill DeWit: You know, I guess we don’t have anything like that. Steven Butala: Right. That’s hilarious. Steven Butala: She cuts it off. Jill DeWit: … on iTunes, or wherever you’re listening, or on YouTube if you are watching us there. While you are at it, please rate us there. We are Steve and Jill.